With the issuance of their final rule last week, the agencies have raised the ceiling on the use of commercial evaluations for the first time in over 20 years, from $250,000 to $500,000. By lifting the appraisal exemption level, the agencies have handed regulated institutions a sizable opportunity to cut their lending costs. "Through the agencies’ supervisory experience with loans that were exempted by the current thresholds and an analysis of loan losses over prior credit cycles for such loans, the agencies have found that evaluations can be an effective valuation method for lower-risk transactions" [pg. 12]. "Requiring regulated institutions to procure the service of a state licensed or state certified appraiser to prepare valuations for commercial real estate transactions at or below the threshold could impose significant additional costs on lenders and borrowers without materially increasing the safety and soundness of the transactions. The agencies’ data and analysis reflect that the increase in the commercial real estate appraisal threshold and corresponding increased use of evaluations could result in a cost savings of several hundred dollars for each commercial real estate transaction…" [pg. 30]. The concluded threshold value of $500,000 is actually higher than the initial $400,000 limit the agencies proposed last summer and opens the door to a greater number of eligible transactions. The agencies gained confidence in this higher limit from industry comments they received as well as by completing an updated analysis of CRE pricing data. On the latter, we think the agencies' rationale based on CoStar's CRE price data is prudent. However when we complement those benchmarks with Boxwood’s proprietary national Small Commercial Price Index (SCPI) trends, we find even stronger confirmation for the new threshold level. Boxwood’s data offers further support for the one-half million dollar threshold. As shown in the nearby graph, Boxwood’s SCPI trends indicate that a conventional commercial property that sold for $423,600 at the market's nadir during March, 2010 would have likely attained a value of $523,100 by December, 2017 – very close to the $509,000 value derived from CoStar price data5. 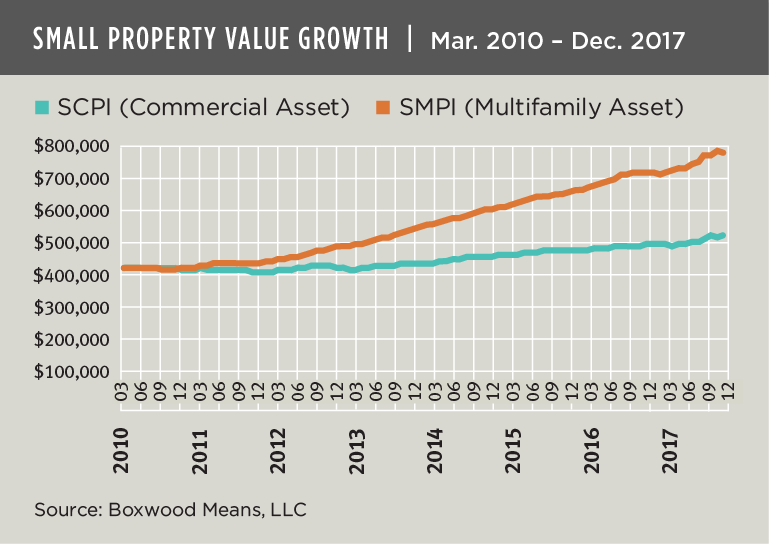 By contrast, and powered by unprecedented demand for apartment investments over recent years, Boxwood’s national Small Multifamily Price Index (SMPI) implies that a similar multifamily asset would have increased to $779,600 by the end of 2017 representing cumulative growth of a robust 84.1% and 8.2% on an annualized basis. So here, too, the evidence suggests that the agencies’ $500,000 threshold level is comfortably below the outer bounds of where a multifamily asset might trade in today’s heated market. Such findings, and the incentive now presented by the agencies in the form of the higher appraisal exemption, may raise the confidence of heretofore non-participating financial institutions that their use of commercial evaluations can reduce the cost of suitable transactions by hundreds, if not thousands of dollars in some cases. 1 The agencies' original $400,000 threshold value proposal was derived from this lowest cyclical point. 2 CoStar's CRE Index is a repeat-sales index that covers commercial and multifamily properties across the country and is inclusive of all price ranges. The inclusion of properties of all sizes and sale prices may explain the sizable 79.4% rate of appreciation we calculated for the Index over this period and add to its historical volatility. 3 By our calculation, this last value represents a cumulative 20.2% rate of growth. 4 The agencies had previously determined that, based on their supervisory experience and compiled data, the proposed threshold level of $400,000 for CRE transactions would not have posed a threat to the safety and soundness of commercial banks. Building on that earlier assessment and combined with industry input, the agencies concluded that the $500,000 threshold would similarly not impose risks on the safety and soundness of financial institutions. 5. Boxwood's property value reflected an annualized growth rate of 2.8% and cumulative increase of 23.5% -- similar to the growth rate implied by the agencies' conservative, ending property value. Boxwood's national Small Commercial Price Index (SCPI) is derived from roughly 7,000 monthly, arms-length transactions including primary and secondary commercial property types under $5 million in value across 125 U.S. metro areas. Since these types of assets (and price levels) in numerical terms comprise the lion's share of loan collateral on the balance sheet of regulated institutions, SCPI is inherently a solid measure of investment price trends with which to track market risk in bank CRE portfolios.